AUGUSTA, Ga. (April 8, 2019) – When our plasma cells start producing a single cancer-causing protein rather than an array of antibody-like proteins to protect us, it’s one of two arms of the Y-shaped protein that’s likely to blame. While increased numbers of either arm, called kappa or lambda light chains, is likely bad news that may ultimately mean multiple myeloma, to more accurately diagnose and monitor the condition, we need to evaluate the concentrations of each light chain differently, investigators report. The bottom line is that in a healthy or unhealthy state there are just more kappa light chains – actually four times more – so to use one standard for both types means cases of lambda-associated cancer or related precancerous states can get missed, the investigators say. “You have to have specific criteria for each because they don’t behave equally,” says Dr. Gurmukh Singh, vice chair of clinical affairs for the Department of Pathology at the Medical College of Georgia at Augusta University. The Walter L. Shepheard Chair in Clinical Pathology at MCG is corresponding author of the study in the journal Laboratory Medicine. “They both go up but kappa goes up a whole lot more,” says Dr. Won Sok Lee, MCG pathology resident and the study’s coauthor. The problem is current diagnostic criteria do not acknowledge that difference, they say. That is why the investigators would like to see the International Myeloma Working Group, which helps set standards for the diagnosis and treatment of patients with multiple myeloma, have criteria that reflect those differences, and that means expecting lower concentration for those lambda-associated lesions, says Singh. With current standards, there is a 30 percent false negative rate – meaning the diagnosis was missed – in plasma cell lesions and a 36 percent false positive rate in patients who actually don’t have it, the investigators say. Right now, physicians may get a variety of tests that look in the serum of the blood, the urine, or both for signs of the abnormal antibody and to see if the normal ratio of kappa and lambda light chains is off, and that’s the crux of the problem, they say. To put it more complexly, whether you have a kappa or lambda-associated lesion, the ratio of one to the other should be greater than 100 times more, according to current criteria. The MCG investigators say that acknowledging the usual lower number of lambda light chains means the ratio for lambda-associated lesions should instead be 12.5 times higher. The MCG investigators looked separately at the kappa- and lambda-associated patients and confirmed these very different numbers in each group, including those with diagnosed disease. While light chain numbers went up in all the patients with cancer or precancerous disease, they went up way more for those with kappa-associated lesions. When the investigators looked at concentrations of these light chains in multiple myelomas, for example, they found the average concentration of serum free light chains was four times higher in kappa-associated lesions versus lambda. This was also true in patients with changes not yet considered cancer. Concentrations of the involved serum free light chain – involved means they were problematic, uninvolved means they were not involved in disease – were significantly higher in kappa-associated lesions. Interestingly, concentrations of uninvolved light chains – meaning kappa light chains in the presence of a lambda lesion – were present at twice the concentration in lambda-associated lesions. In fact, in the face of cancer, they found the concentration of lambda light chain levels was less than one-fourth that of the kappa chain. The level of kappa chains in lambda-associated lesions was twice as much as the level of lambda chains in kappa chain lesions, they say, and another reason that one ratio cannot be used to assess both lambda and kappa, they say. To further complicate the mathematics of figuring out what is problematic when ratios of the two start shifting, sometimes the ratio of kappa to lambda actually stays normal even when an abnormal immunoglobulin is showing up in the urine. Conversely, nearly 40 percent of patients have an abnormal ratio without having monoclonal gammopathy, the name for this condition when plasma cells start making a single immunoglobulin. All these variabilities mean some patients, particularly those with the less common lambda chain-associated lesions, could go undiagnosed, Lee says. Both kappa and lambda can be affected, but it’s usually one or the other, and once detected it’s the same disease and treated the same way. 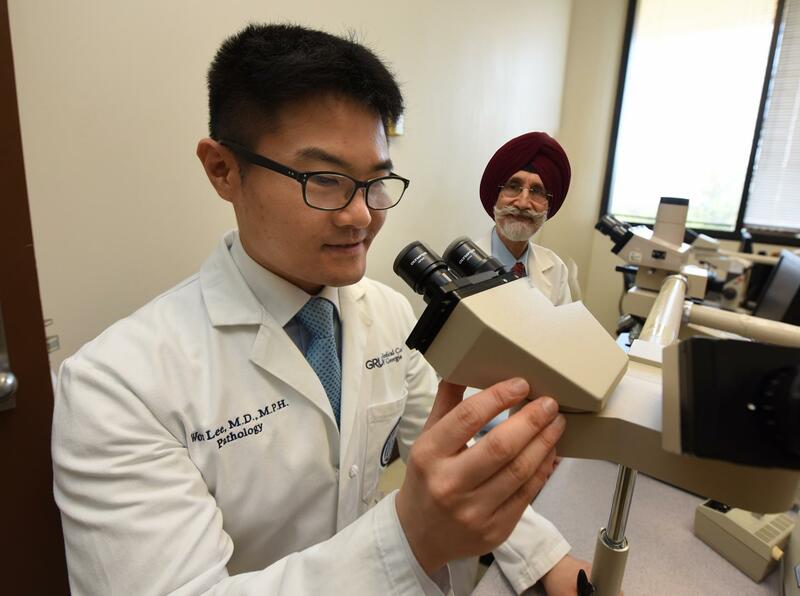 It’s diagnosing and following the disease that can be problematic, Singh and Lee say. In addition to looking at light chain concentrations, current tests also include protein electrophoresis, which enables physicians to literally see one huge blob of immunoglobulin rather than the usual smears made when plasma cells are making more like 100 million different ones. Just like the number of kappa free light chains is higher, so are the number of cases of kappa-associated cancers, Singh notes, but there are still many patients with lambda-associated problems that need to be identified. He and Lee reported this summer in the Journal of Clinical Medicine Research that light chains in both the urine and blood need to be examined when diagnosing monoclonal gammopathy. Current testing trends lean toward looking in the serum only which also can lead to problems detecting lambda-associated conditions. Click here to see the full study https://academic.oup.com/labmed/advance-article/doi/10.1093/labmed/lmz007/5430491?searchresult=1.